Over the years I have been fortunate to have accumulated many rich experiences in the mountains. From my earliest days of teaching skiing I realised what a great experience it is to pass on my knowledge. 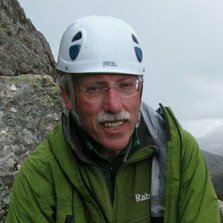 After many years (30 years overdue someone said) I became qualified as a rock climbing instructor (SPA) and then as a Mountain Leader (MLs). I am also a DofE Supervisor and Assessor. I now take individuals and groups out into the hills. From Duke of Edinburgh to year 7 kids to adults in all conditions. In addition I help train and assess budding ML’s. I am fully insured and First Aid qualified. I love everything to do with Mountaineering, Hillwalking, Skiing, Ski Touring, Rock Climbing, Adventure Travel, Backpacking as well as a bit of Mountain Biking, Road Biking, and many other outdoor activities. Member of British Mountaineering Club, Mountain Training, Carlisle Mountaineering Club. Duke of Edinburgh Award Assessor. Working outdoors as well as indoors. Teaching mountain skills to anyone that has a passion for the outdoors. Enthusing those that want to know more about our mountains. The single biggest request I get is for Navigation skills. That’s because most people perceive map and compass work as complicated and difficult. In short, it isn’t. Start at the right place and you’ll finish at the right place. You wouldn’t rush out buy a DVD recorder and expect to record a cup final ten minutes before the game just by plugging it in and fiddling with the remote box. With a simple approach everyone can take a bearing and point a compass. Would you start reading War and Peace in the middle and expect to understand what’s going on? Learn to read a map by identifying features on the ground and build up a logical picture. Usually folk want hands on navigation skills but I always go through the range of skills to some degree – route planning, group management, hazards, emergency procedure, first aid, equipment, flora and fauna, wild camping, history and archaeology and industrial heritage. Pretty much anything you want to know and there’s plenty of chat. We can concentrate on any aspect by request. No racing flat out up hills either! Group size can be two / three / four up to a maximum of ten at £ 50.00 a head per day but with a maximum cost of £200.00 for the whole group. Personal tailored skills sessions at £150.00 a day. Evening sessions are from £12.00 to £65.00 per person. I also do Mountain Leader (ML) pre-assessment and refresher days, ML Training and Assessment by arrangement with an approved provider too. Evening sessions are usually two and a half to three hours although earlier in the year I do “walk into darkness” where we get some night nav done. Day sessions are six to eight hours. Terrain varies from easy paths and tracks to rough off track mountain terrain. Wild camping is usually an overnight. Mid morning start, camp high, an evening walk and return the following morning. £300.00. Group size maximum of eight. Skill levels are often mixed as each member can be given encouragement at their specific level. Often novices just want to look over someone’s shoulder and gradually gain confidence in their own skills. Or pick up the ‘phone!